OnePlus has announced that it will be selling the One without invites on April 1st in India, as part of their celebrations for moving into a new office. 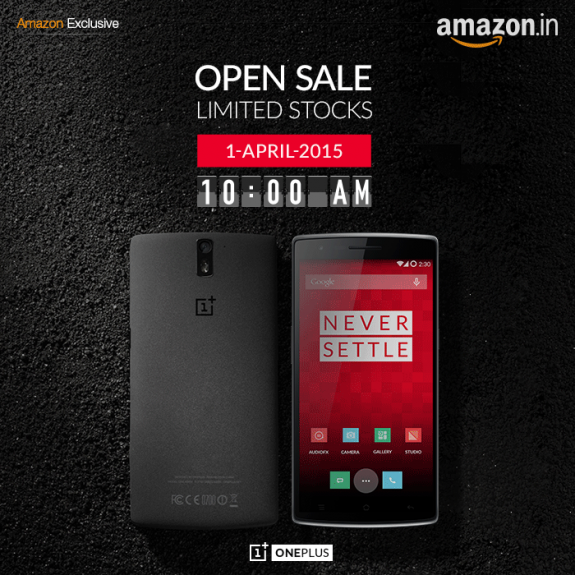 This is the third time the phone will be available in an open sale in the Country. The first open sale was held way back in February, while the second one was held recently, on March 24, to be precise. The 16 GB Silk White OnePlus costs Rs. 18,999 and the 64 GB Sandstone Black retails for Rs. 21,999. Both variants of the phone will be up for grabs without an invite, exclusively on Amazon India, from 10 AM, on April 1st in India. This is a limited time sale, and only valid until stocks last. This is no April fool’s joke!